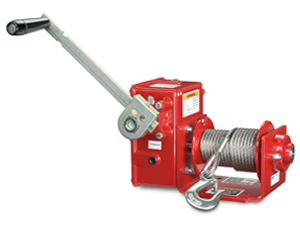 Hand Winches - Thern Heavy Duty Hand Winches | Thern, Inc. When you need to lift, lower or position a heavy load more quickly, Thern is ready to lend a hand with the most dependable hand winches available. We offer manual, heavy-duty hand winches, portable hand winches and crank winches that help you work more quickly and efficiently. Our worm gear and spur gear hand winches are designed to perform better and last longer no matter what your application. From construction to maritime to manufacturing and more, our hand winches are built tough to meet the demands of the job in any environment. The Spur Gear Series of hand winches have up to 10,000 lb. capacity and lifts faster than a worm gear, but takes more force. Thern’s machine-cut spur gears provide long-lasting service and are available in a variety of configurations to meet the performance requirements of your manual pulling, hoisting or lowering application. The Worm Gear Series of hand winches have up to 4,600 lb. capacity and lift slower than a Spur Gear, but takes less force. Thern’s Worm Gear Series of hand winches are available in multiple configurations and performance ratings designed to keep things moving smoothly and efficiently. Worm gearing provides extra load-holding power for accurate positioning and secure control of loads.